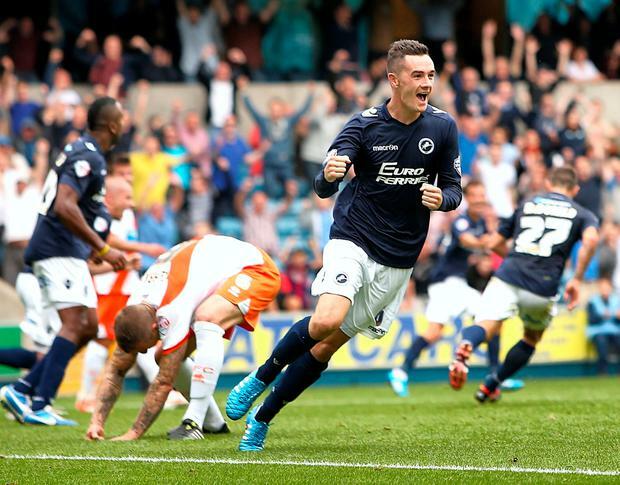 With three games, three wins and three clean sheets from their FA Cup battles with Premier League teams this season, are the Lions of Millwall really the underdogs any more? It certainly seems that, while top-flight clubs have fallen out of love with the competition and feel no shame or pain when they lose to a lower-league side, the Millwall boys - with Dubliner Shaun Williams at the heart of their midfield - love this stage. Bournemouth (3-0), Watford (1-0) and Leicester (1-0) have all been put to the sword by the Lions this season, although all three wins were at home for Williams' side and the task tomorrow is a 10-mile trip across London to face Tottenham at White Hart Lane. "We are punching above our weight. For our fans this is great but as players we enjoy it too," says Williams, settled into life as Millwall man since his move there from MK Dons three years ago. Really, Spurs should have little trouble against the League One side tomorrow but it also depends on how much effort the Premier League side put into it as Williams stresses how desire helped them overcome those three Pemier League teams to date. "I think it just means more to us. We have more to gain financially, progressing through the rounds is worth a lot to the club and the players. The Premier League players are all millionaires so it doesn't mean as much if they push on or not," Williams told The Herald. "With us as well, we are a more heart-and-desire type of team, we have a never-say-die attitude, that does well for us." Williams, yet to score in the Cup this season, has enjoyed the run but one game stands out. "I think beating Leicester in the last round was the highlight for me," he says. "When we beat Bournemouth and Watford, we were never felt we were out of the game but it was different against Leicester, it was more smash-and-grab. "They were in a different league to the other two Premier teams we played, we just couldn't get the ball off Leicester. They were sharp and they seemed like they really wanted it, compared to Watford and Bournemouth. "So that one, Leicester, stands out: nicking it at the end, the celebrations with the fans." Williams says he expects more of a battle from Spurs. "They might take it more seriously tomorrow as the Premier League seems to be out of their hands, with Chelsea doing so well, they will see this as a chance to win a trophy and they won't rest too many players, but we won't get caught up on them too much, we'll look to our team and our strengths," he says, the former League of Ireland man, keen for a return to Wembley and the chance of adding to a medal collection which consist of an FAI Cup success with Sporting Fingal. "With the semi-final being at Wembley, that's a massive incentive for a club like us," says Williams. "We were in Wembley last year for the play-off final but lost, hopefully it's a happier occasion this time if we get there. I'd love to play in Wembley again in a final. "The year we got to the FAI Cup final, the Aviva Stadium wasn't built yet so the final was in Tallaght. It was great to win it, but it was probably less of an occasion because you were used to playing in Tallaght. Wembley would be a great stage to play on again." But the added attention this week for the Lions has been welcome. "You get a lot more phone calls from home for a game like this, compared to Oldham away on a typical weekend, we had the TV cameras in at the club in midweek, we wondered what it'd be like to play in the Premier League and have that sort of scrutiny every week," says the Dubliner. Erik Lamela is one of two absentees for Spurs, with Danny Rose still nursing a knee injury, but Lamela is unlikely to play again this season, where Spurs plan to show their opponents respect tomorrow. "We are very focused because the game will be very tough," manager Mauricio Pochettino said. "It is another London derby and we were watching all the games and they fully deserve to be in the quarter-finals. They were better than the Premier League teams. We are aware about that situation. We respect them. It is clear how they play, very compact, clear in their idea how they manage the game."